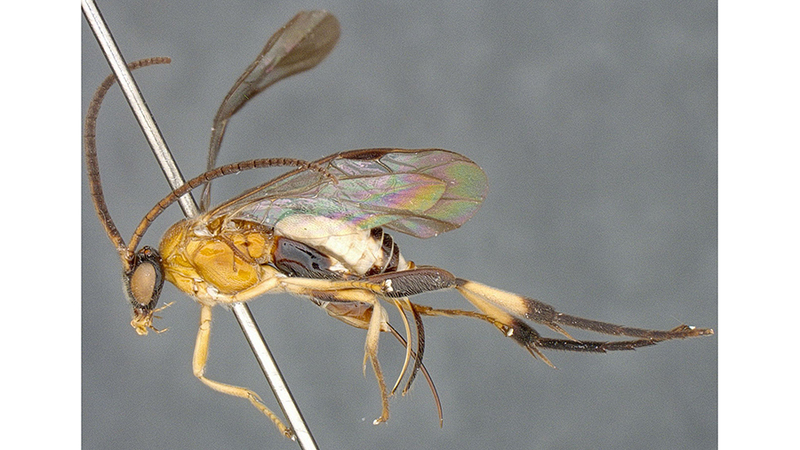 A total of 17 new genera and 29 new species of parasitoid wasps were identified following a study into the material deposited at major natural history collections around the globe in an attempt to further uncover the megadiverse fauna of the group of microgastrine wasps. The novel taxa known to inhabit the tropics, including the Afrotropical, Australasian, Neotropical and the Oriental region, are published by Dr Jose Fernandez-Triana and Caroline Boudreault of the Canadian National Collection of insects in Ottawa in a monograph in the open access Journal of Hymenoptera Research. Curiously, amongst the newly described wasps, there are several newly described genera and species, which received particularly amusing names. Reported from the Australasian region, the genus Qrocodiledundee is not only a nod to the famous Australian action comedy ‘Crocodile Dundee’, which also happens to be a favourite of the lead author’s, but also refers to Jose’s own nickname. In the past, Jose himself used to track down and catch crocodiles for scientific study, and was even bitten by one, much like the fictional character played by Paul Hogan. Further, the so far only member known in the genus carries the name Qrocodiledundee outbackense, where the species name (outbackense) alludes to the Outback – the vast and remote interior of Australia. Five of the newly discovered species are named in tribute to five major natural history institutions, which are greatly appreciated by the authors due to their outstanding insect collections. These are the species Billmasonius cienci, Carlmuesebecki smithsonian, Gilbertnixonius biem, Jenopappius magyarmuzeum and Ypsilonigaster naturalis referring to the Canadian National Collection of insects in Ottawa (CNC), the Smithsonian’s National Museum of Natural History, the Natural History Museum in London (formerly known as the British Museum, abbreviated as ‘BM’), the Hungarian Natural History Museum (Magyar Természet-Tudományi Múzeum) and the Naturalis Biodiversity Center in Leiden, respectively. The rest of the new species and genera were given more conventional names, inspired by the wasps’ distinctive characters, type localities, or were given the names of prominent scientists, as well as beloved friends and family. Despite of the scale of the present contribution, it is highly likely that there are many more microgastrine wasps still awaiting discovery. “Although an updated and more comprehensive phylogeny of Microgastrinae is probably years ahead, we hope the present paper contributes toward that goal by describing a significant number of new taxa and making them available for future studies,” conclude the authors.